Steel is one of the most common used metals. Manufacturers across a number of industries use for its stregnth, recyclability, and relatively low cost. Steel is a global commodity that the US usually imports from places such as China and India. Recently, President Donald Trump has announced an investigation into weather or not cheap imports pose a threat to national security. 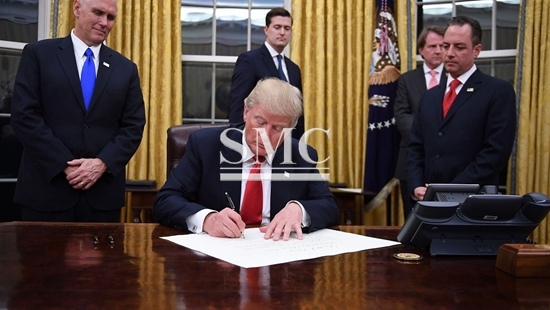 During an Oval Office ceremony with several prominent US steel executives, President Trump signed an executive order asking the commerce department to assess the effects of steel importation has on the US, particularly during a time of military build-up. At the ceremony Trump stated, “Steel is critical to both our economy and our military. This is not an area where we can afford to become dependent on foreign countries”. Trump would also like to take this opportunity to help the American workers maintain and find work. He firmly believes that cheap imports are “killing” US manufacturers. During the first quarter there was a 19.6% increase on steel imports. This was extremely damaging to the US’s domestic steel industry. This spike in steel imports is despite the more than 150 anti-dumping and duty orders on steel products already in place. But the US secretary of commerce Wilbur Ross stated “[they] did not substantially alleviate the negative effects that unfairly traded imports have had on the United States steel industry. . . Repeated efforts by the United States to encourage other countries to reduce and address the underlying causes of excess capacity in the steel markey have had little meaningful effect”. Ross feels that if the situation does not change the importation of steel could have catastrophic effects to the investment in the US steel industry, as well as eleminate thousands of skilled worker positions in the steel industry. Currently the US steel industry is only operating at 71% of its capacity. Steel imports account for more than a quarter of the domestic steel market in the States. Most of this imported steel is coming from China. Today China is responsible for producing over half of the worlds steel. While Trump insists this has nothing to do with China, it will weaken trade relations with Beijing. Only time will tell the effects the order will have for both the US steel industry and Chinese trade relations.